Einkorn wheat (from German Einkorn, literally "single grain") can refer either to the wild species of wheat, Triticum boeoticum, or to the domesticated form, Triticum monococcum. The wild and domesticated forms are either considered separate species, as here, or as subspecies: Triticum monococcum subsp. boeoticum (wild) and T. monococcum subsp. monococcum (domesticated). Einkorn is a diploid species (2n = 14 chromosomes) of hulled wheat, with tough glumes ('husks') that tightly enclose the grains. The cultivated form is similar to the wild, except that the ear stays intact when ripe and the seeds are larger. The domestic form is known as "petit épeautre" in French, "Einkorn" in German, "einkorn" or "littlespelt" in English, "piccolo farro" in Italian and "escanda menor" in Spanish. 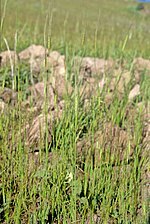 The name refers to the fact that each spikelet contains only one grain. 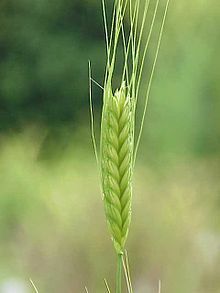 Einkorn wheat was one of the first plants to be domesticated and cultivated. The earliest clear evidence of the domestication of einkorn dates from 10,600 to 9,900 years before present (8650 BCE to 7950 BCE) from Çayönü and Cafer Höyük, two Early Pre-Pottery Neolithic B archaeological sites in southern Turkey. Remnants of einkorn were found with the iceman mummy Ötzi, dated to 3100 BCE. Einkorn wheat is one of the earliest cultivated forms of wheat, alongside emmer wheat (T. dicoccum). Hunter gatherers in the Fertile Crescent may have started harvesting einkorn as long as 30,000 years ago, according to archaeological evidence from Syria. Although gathered from the wild for thousands of years, einkorn wheat was first domesticated approximately 10,000 years BP in the Pre-Pottery Neolithic A (PPNA) or B (PPNB) periods. Evidence from DNA fingerprinting suggests einkorn was first domesticated near Karaca Dağ in southeast Turkey, an area in which a number of PPNB farming villages have been found. An important characteristic facilitating the domestication of einkorn and other annual grains is that the plants are largely self-pollinating. Thus, the desirable (for human management) traits of einkorn could be perpetuated at less risk of cross-fertilization with wild plants which might have traits – e.g. smaller seeds, shattering seed heads, etc. – less desirable for human management. Einkorn is a popular food in northern Provence (France). It is also used for bulgur or as animal feed in mountainous areas of France, India, Italy, Morocco, the former Yugoslavia, Turkey and other countries. None of the species and hybrids of wheat are suitable for people with gluten-related disorders, as celiac disease, non-celiac gluten sensitivity and wheat allergy. ^ Le Brun, Alain (Centre national de la recherche scientifique (França) (1992). "El poblamiento neolítico en la Isla de Chipre: el establecimiento de Khirokitia". Treballs d'Arqueologia (2): 51–67. ISSN 1134-9263. ^ "Crops evolving ten millennia before experts thought". ScienceDaily. 23 October 2017. Retrieved 23 October 2017. ^ Allaby R, Stevens C, Leilani L, Maeda O, Fuller D (Oct 2017). "Geographic mosaics and changing rates of cereal domestication". Philosophical Transactions of the Royal Society B. doi:10.1098/rstb.2016.0429. ^ Zohary, Daniel; Hopf, Maria; Weiss, Ehud (2012). Domestication of Plants in the Old World: The Origin and Spread of Domesticated Plants in Southwest Asia, Europe, and the Mediterranean Basin (Fourth ed.). Oxford: University Press. p. 38. ISBN 9780199549061. ^ Heun, M.; Schäfer-Pregl, R.; Klawan, D.; Castagna, R.; Accerbi, M.; Borghi, B.; Salamini, F. (1997). "Site of Einkorn Wheat Domestication Identified by DNA Fingerprinting". Science. 278 (5341): 1312–1314. doi:10.1126/science.278.5341.1312. ^ a b Hopf, M.; Zohary, D. (2000). Domestication of Plants in the Old World: The Origin and Spread of Cultivated Plants in West Asia, Europe, and the Nile Valley (3rd ed.). Oxford, Oxfordshire: Oxford University Press. pp. 33–43. ISBN 0-19-850356-3. ^ Payany, E (2011). Le Petit Épeautre. LaPlage. ISBN 978-2-84221-283-4. ^ Penagini F, Dilillo D, Meneghin F, Mameli C, Fabiano V, Zuccotti GV (Nov 18, 2013). "Gluten-free diet in children: an approach to a nutritionally adequate and balanced diet". Nutrients. 5 (11): 4553–65. doi:10.3390/nu5114553. PMC 3847748. PMID 24253052. ^ "World Breakthrough On Salt-Tolerant Wheat". ScienceDaily. March 11, 2012.